“Murray paints each panel separately, as if it were a single work. She gets her ideas for color from a paint shop in SoHo. Then, with the help of an assistant who comes to her studio once a week, she begins placing the panels this way and that. “Basically, I follow my nose. I get bored with analytical thinking, arranging. The work appears to be getting more sculptural, but I’m interested in the illusion of making something look three-dimensional in two-dimensional space. Anyway, I want the panels to look as if they had been thrown against the wall and that’s how they stuck together.” Elizabeth Murray Shapes Up Paul Gardner, Artnews, September 1984. Many of the “New Abstractionists” began to expand upon the idea of the painted thing in order to attack the limitations of Greenberg’s flat surface. David Row broke the thing into pieces. David Reed chose unconventional sizes and shapes for his works and over layed those shapes like windows within those paintings. 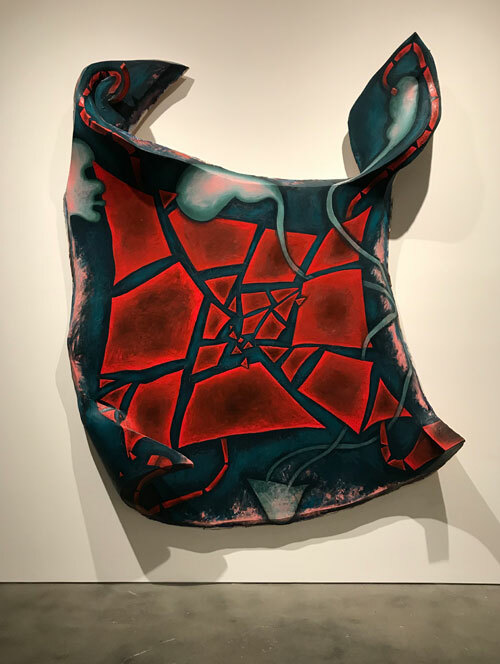 Elizabeth Murray brought her Surreal imagery directly onto the wall in the same way that Stella’s geometric logic shaped his Aluminum Paintings. Painted things.